Prior to joining The Slimming Clinic, I was constantly attempting to lose weight. The problem was that I loved my big dinners – mashed potato with cheese and belly pork was my favourite, but after something savoury I’d always crave something sweet too so it was double the trouble. This is where the chromium tablets really help as they reduce sugar cravings so they’re perfect for me. At one point, I was getting takeaways most days and realised that it had to stop. I was overweight for my height and I felt really uncomfortable with my body, especially my stomach which made me feel very low. After having my fourth child, I was unable to lose any weight so I thought enough was enough. That’s when I joined The Slimming Clinic. I started the weight loss programme and also signed up for the Power Plate, which has been totally amazing. Combining both has given me incredible results, especially in relation to my stomach area which proved problematic after my C-section. I don’t believe in dieting, I believe in lifestyle changes which is why The Slimming Clinic is perfect. You don’t feel like you are on a diet as you don’t have to completely restrict yourself from anything. I’m pretty laid back with the eating. If I have a hiccup it’s okay, I just go with the flow and get back on it the next day. I found it really easy to lose the weight; using the Power Plate in the Cardiff clinic is incredible – I love it. I recommend it to everyone! I do it twice a week and the price is fantastic. It motivates me so much when I see results, so I’m really committed to it. 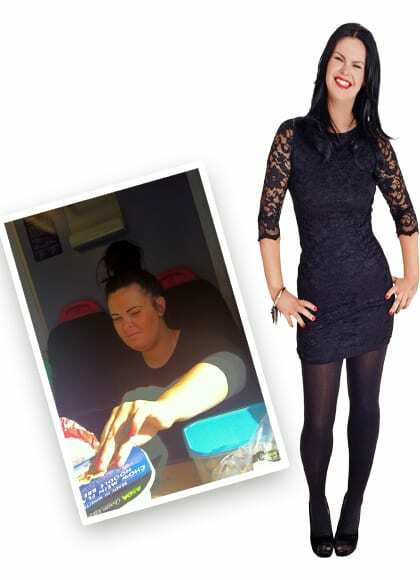 The staff at The Slimming Clinic have been amazing throughout, they always make me feel really comfortable, they are polite and never look down on you just because you are bigger. I am now really active and have so much energy whereas before I had to have afternoon naps everyday but now I’m running everywhere. I would have never seen myself doing that before! For the first time in a long time, I’m completely focused on my lifestyle. I also wouldn’t have had the confidence to wear nice dresses and do this photoshoot as I was so shy and kept myself to myself. Thank you The Slimming Clinic for giving me the confidence that I needed.